This is an amazing and extra large, greenish-aqua (aka "sea-green"), well-etched, DT aquamarine crystal from Brazil with golden healer held in the etchings … that makes him look greener than he is. He is well terminated all over and a wonderful handful of aquamarine energy! It’s interesting as aquamarine is a beryl and morganite, goshenite, emerald, aquamarine, heliodor and hiddenite are all the same family just with different impurities that contribute the characteristic colors. He is 4.8 oz and 2.7" by 2.1" by 1.1" … and a study in aquamarine evolution. Aquamarine is pretty much a forgotten crystal except as used in jewelry. 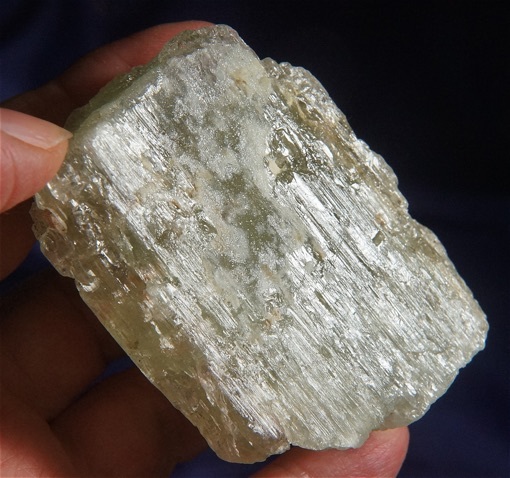 But, it is one of the most important crystals to the crystal healer or Reiki practitioner! Aquamarine is known as the Stone of Courage. It helps one understand the core Self and take pride, delight and pleasure in all the Self is. And with that knowing comes not just courage, but the ability to transmute negativity. For once you truly know your Self, you know that negative energies cannot harm you or take hold of you. You are able to turn them around into positive! He is the perfect size for laying on the body or personal meditation. He would be excellent used on a daily basis where he can always provide the right energies when you need them most!